Yelp was founded in the year 2004 with the purpose of helping people in finding local businesses such as hair stylists, restaurants, shopping centers, dentists, and more. In these 10 years, Yelp has got more than 57 million local reviews. Now, Yelp has launched a new Yelp Trends Tool that lets you enter search terms and then compare 10 years of historical review data. This tool gives you access to its data collected over the decade to get a look at trends on a city by city basis. With this Yelp Trends Tool, you can compare the popularity of up to three keywords or phrases in one go. These keywords can be brands or may be product name. For example, we compared the relative mentions of three active life options in New York, and the results are CrossFit, Bikram and Zumba with the trends graph. From food trends to popular slang to short-lived beauty fads (Brazilian blowout anyone? ), Yelp Trends searches through words used in Yelp reviews to show you what’s hot and reveals the trend-setting cities that kicked it all off. 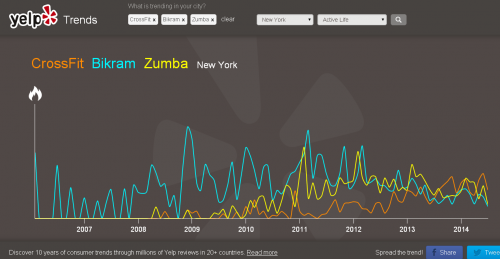 Yelp Trends Tool has made available millions of Yelp reviews data through 98 cities in more than 20 countries. But, Yelp has not listed every city. It would have been better if the graphs were embeddable, but that’s not an option. Yes, you can share the results with your friends and followers on Facebook and Twitter. Given the high volume of information available at Yelp in its millions of reviews, it does make sense in putting those details to some use. The search helps you find interesting data points. By using Yelp Trends tool, you can learn about the trends which are on decline, and the ones which your local market loves right now. This data is also useful in determining about the next big trends in the city. Yelp also recommends that students can tap into the data for various projects. Also, they can win $5,000 for creating unique and compelling projects using the data offered by Yelp Trends tool. You can get more details about the challenge by clicking here.